The philosophy behind SixteenR is that "the scarf can be a tool of empowerment". Founder Nancy Hoque doesn't just sell scarves through her website, but works to promote this concept. With an innovative take on style, design and photography, SixteenR really stands out amongst other hijab brands. 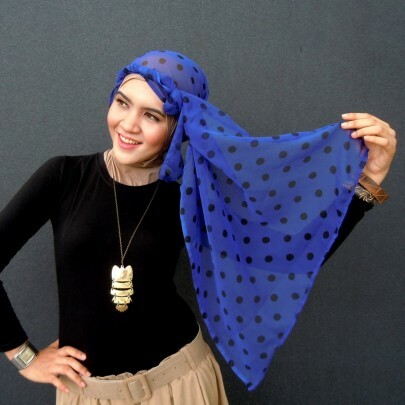 I recently worked on a collaborative style feature for their blog called Edited by Hijab Style, and was later sent the My Blue with Spots scarf from their Supersonic Collection to review! Due to the fabric, the scarf tends to 'rustle' a little when worn, but does keep it shape well. It also looks neat and the print isn't overpowering - just adds a hint of interest to a plain outfit. I found that I needed to wear a cotton undercap (as I always do anyway) as the scarf was a little slippery on it's own. The delicate fabric also means care is needed when using pins. Generally I really loved the colour and the print of the scarf, which is more unique than the usual hijabs being sold. Although the fabric is also quite nice, I found the stiching at the edges to be poorly done, with holes already appearing on one edge. I'd also like to see more product information on the website, including fabric, size and care instructions. On behalf of sixteenR.com, I apologize for the your experience with the hemming. All of our scarves are hand-printed, hand-woven or hand-sewn, so there may be imperfections. Having satisfied and happy customers is very important to us. We will happily exchange your scarf for a new one and will do the same for any of our customers all over the world. Please email hello@sixteenR.com for any questions.